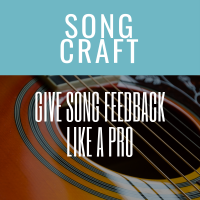 If you’re part of a songwriting group, one of your activities is probably getting and giving feedback on songs. And, one of the most valuable things about being in a group is access to feedback, so being able to give it becomes part of the the group dynamic. It makes the experience more communal and ultimately creates a “we’re in this together” kind of strength for the group. So how do you make sure you’re a strong, contributing member of your song tribe each time someone brings a song to the group for help? Feedback should be geared around helping the songwriter with a specific skill or focus on the song’s betterment. Feedback is not critique. Your intention should be building up confidence, not breaking it down. Feedback should always be encouraging by offering suggestions to improve the song if something is not working. Constructive feedback is not simply rewriting lines or making word change suggestions. The goal is a better song that fulfills the songwriter’s intention. The song is the priority. What is it trying to express? What’s the message, and is everything helping to make sure the song’s intention is clear? Don’t just suggest a change for change’s sake. Listen to the song all the way through and read the lyrics if they’re provided. Based on what you heard did something jump out at you as not working very well? What is the main point of what you’re trying to get across? Start with the thing that wasn’t working for you, then explain why and finally a potentially way to solve for it. Notice I didn’t tell them what to write. You’re there to help someone else not only make their song better, but grow their skills. Simply editing their lines, suggesting words more in line with what you would write, or simply making the change with no explanation isn’t helpful long-term for them. Try to offer your comments in a coaching way so they understand the “why” and can incorporate a new fundamental into their writing. Songs require the combination of lyrics and music. Try listening and not reading the lyrics (if provided) rather than reading and letting the song fly by. How does the music compliment the lyrics? Or does it (e.g., happy song with minor chords)? If there’s a mismatch, it may be intentional (clarify with the songwriter) – does it work? Is there a melodic motif? If not, is one needed? Could the chords be changed slightly to make it more interesting? Most feedback responses will focus on the lyrics. Being able to comment and help with the music is always a benefit to everyone in the room. Pick one thing you think stands out – good or bad – and focus on it. How does it impact the song overall? Too many road signs and obstacles in the dark. Where’s the time to hold you close or walk on a beach? When it was you and me, and we were starting out. Like a story book, we loved the simple things. Notice how the first line of the chorus diverges from the main idea of the song: the idea in the line is complicated. Because this line takes the listener off track, the rest of the chorus suffers in its ability to provide a larger meaning to the song, which, at the end of the day, is the purpose of the chorus. I really like the song idea here. One place where I got a little caught up in thinking about what was happening, versus it being clear and easy to follow, was at the beginning of the chorus. The first line is a complicated idea to follow. I’m wondering if it might be simpler to start the chorus with a larger idea and therefore an easier transition for the listener. The big idea comes at the end, but what if you used it at the beginning, then framed the chorus with the idea that simple things are complicated? You could start the chorus with “Simple things are . . .” – then go into the what. Which, actually turns out to be the complexities of life told in an idyllic and simplified way. Phrasing and word choice are part of someone’s writing style. It’s not always best to change words because of your writing style. For example, “change white knight to shining knight” because you never liked “white knight” is a language choice you would make for your song. If a word of phrase is metrically throwing off a line, that’s different – meter matters. Or, if the “white knight” is too cliche or isn’t really accurate for the analogy being created, that’s an issue. But then say you think it’s an issue for a listener and why. Don’t simply tell the songwriter to change a word. Most songs have larger core issues, and word choice is exactly that – choice. To be a valuable sounding board, find the larger problems hurting the song. And – because you can, it will help your own songwriting. Don’t be that guy/gal who simply rewrites everyone’s lines. You’re there to help them become a better songwriter. Don’t simply edit their lines with no explanation of how it makes the song better. Don’t go in with a “here’s why this song doesn’t work” approach. There are plenty in the industry who will. You’re part of their support network. Be supportive. Don’t focus on small things that won’t help their larger skill set. Are they working on creating stronger verses? Do they have a tendency to creative clever hooks, but the rest of the song doesn’t support it well? Focus on elements than can align with their songwriting goals. Don’t focus on what you think the song should be. What does the song want to be? What do they want to achieve with their songwriting? Help them do that. There’s no point in offering feedback if you do it in a way that will result in the recipient immediately shutting down or ignoring you because they’re offended. How you deliver your feedback is crucial to whether or not it’s heard or acted on. Use the “good – bad – good” formula to help ease people into hearing an improvement. E.g., here’s what I liked, here’s what didn’t work so well and why, this was really strong throughout. Encourage the recipient to clarify anything that may not make sense to them. After all, if they don’t understand your suggestion, it’s unlikely it will be implemented into the song. Show up with songs for feedback and don’t always be the “editor/consultant” on the songs of others! When someone offers feedback on your song, acknowledge the fact that they gave it. A thank you, asking for clarification, an “OK – that makes sense” or writing down their comment in the margin of your song while doing all of the above is acknowledgement. Part of your role is helping the person asking for feedback end up with a better song. Their song – not yours. Stay true to their style and what they’re trying to achieve with the song. Not everyone is trying to write a hit for Nashville – don’t give them feedback as if they are. You’ll be amazed at how your feedback changes when you have a sense of what they’re trying to do with their songs. Your song tribe is a group of individuals who respect one another, regardless of skill level, and want success for every individual in it. Be a full, supportive, participating member.